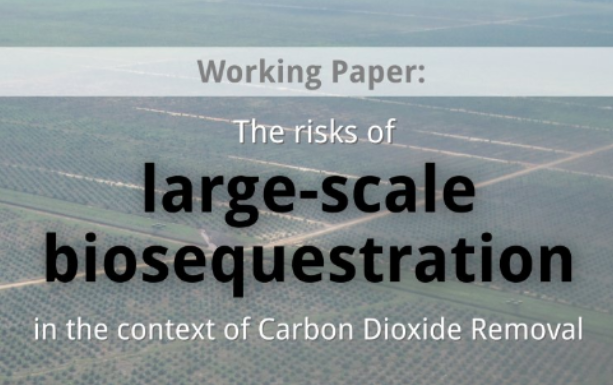 At the start of a major Climate Engineering Conference  in Berlin, the Global Forest Coalition  has launched a Working Paper that highlights the risks of different proposals for large-scale Carbon Dioxide Removal. The report finds that while the most prominent CDR approach, Bioenergy and Carbon Capture and Storage (BECCS) technology is still in a state of “infancy” and is unlikely to be rolled out on a global scale, biosequestration in the form of afforestation through monoculture tree plantations is already rapidly expanding and causing significant negative social and environmental impacts.. The Paris Agreement’s target of limiting global temperature rise to 1.5 degrees is largely dependent on CDR approaches and climate finance institutions are already supporting such afforestation schemes, largely due to the strong emphasis on private-sector involvement in climate finance mechanisms such as the World Bank’s Forest Investment Program. The report describes existing trends in the field of large-scale biosequestration. It examines the social and ecological impacts of such projects and discusses whether or not these are viable climate solutions. It also showcases successful community led biosequestration alternatives which could prove to be more effective in reversing climate change and in providing long term sustainable livelihoods. “It would be a smarter and more cost effective choice for policy makers to support community-based forest restoration initiatives, but sadly the strong influence of corporate interests in climate policy has caused governments to prioritize subsidies for commercial tree plantations over these community-led projects” says Dr. Simone Lovera, director of the Global Forest Coalition. Riding the geostorm: Is it possible to govern geoengineering? Why is Geoengineering being discussed at UNEA, and how should civil society respond? Geoengineering Monitor is a joint project of Biofuelwatch and ETC Group, with support from Heinrich Boell Foundation.